In 1998, the museum Boijmans van Beuningen acquired a painting by Gerrit Pietersz. 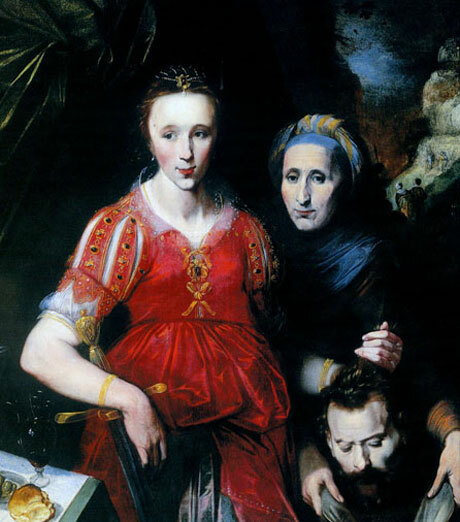 Sweelinck, Judith Shows the Head of Holophernes, from 1605. Sweelinck was not very well known, and surely not as famous as his brother the composer. I happened to discuss the subject of Judith with a member of the museum’s staff, who told the other staff about my vision. As a result, the museum invited me to present the painting to the public. I had never handled artworks before, but I had published critical writings about exhibition practices. This was the opportunity to persuade the museum staff to let me do more than just presenting the painting. Instead, I made a presentation in a large gallery and a smaller space, in which I integrated old master paintings, drawings and prints with household goods from the period, and even framed photocopies of other paintings on the same theme. My experiment involved investigating how to understand the multiple and contradictory connections between the ‘work of art’ and the way we (can) frame it, so that I could construct a mise-en-scène that would work. The exhibition became a deconstruction of the painting’s framings. The new painting came to hang on a free-standing wall painted in blood-red, with two wings. On that screen I put paintings that decomposed the newly acquired work into different genres: portraits, landscapes, genre, and still-life. Exploding it from the inside-out, so to speak, the walls of the gallery were filled with portraits of women, landscapes, mythological subjects of killing women, paintings by other early 17th century Haarlem painters, and household goods representing the Judith topic. The show was up from October 1998 to January 1999. Chapter 4 of my book Travelling Concepts is devoted to this exhibition.